Glass Block is a delightful and versatile medium to improve your indoor living space and also lend an exquisite touch to a suitable exterior, such as a patio. Allow us at AAP Construction to give your home a touch of class with our glass block service. 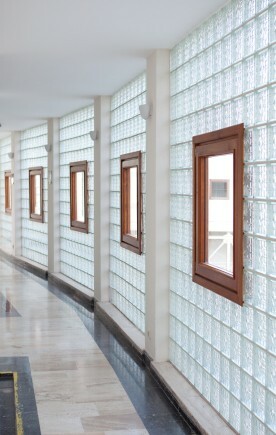 The possibilities afforded by glass block are numerous. You can have your basement bar paneled with a deep indigo glass block. A reception desk at your office can be fronted with welcoming, sea-blue tinted glass block. And the type and tint of these glass blocks are far from uniform: different refractive indexes give different effects. Take advantage of our experience, gained since 1993, by calling us at (973) 298-1013 to learn about these possibilities – and get a set of no-obligation, free quotes too! More choices for you: apart from colors, glass blocks come in clear, iced, wave, frosted, and etched variants. AAP Construction can make internal walls with glass block, using blocks of predominantly one tint and type, say a grass-green wave block, accented with a few contrasting cherry-toned etched blocks. Perhaps you're in the market for a glass block shower stall; the kind you would have seen in upscale hotels? We'll give you choices not only in types and kinds of glass blocks but even in the design of the shower stall, along with prices that won't strain your pocket – that's how we've been establishing our reputation since 1993. Do you want something as straightforward as a couple of glass block windows? No problem. AAP Construction will do glass block windows with the same professionalism and care as we would build a glass block shower stall! No matter what your glass block needs, phone us at (973) 298-1013 for a free quote.